Ibanez builds guitars for all levels of players—from beginners to the most demanding masters of the instrument. Regardless of price, Ibanez always strives to offer the absolute best sound, style, and playability in its class. It’s this mindset that has earned the GRX70QA its place as the one of the most popular start-up guitars of all time, responsible for launching numerous musical careers around the world. 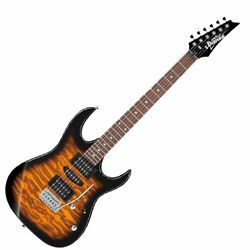 The GRX matches classic good looks with the Ibanez eye for detail. Its Poplar body is adorned with a handsome Quilted Maple Art Grain top and Maple neck features a Treated New Zealand Pine fingerboard with white dot inlays. High output Infinity R humbucker pickups provide delicious driven tone, courtesy of a 5-way selector switch that provides access to whatever tonal palette you need. A T106 tremolo rounds out your stylistic weaponry.